Tunnel boring machines (TBMs) use either a rotating cutter head a or backhoe system to excavate soils and soft rock formations. Conventional TBMs are suitable for single pass direct jacking of steel casing, RCP and polymer pipes, as well as dual pass tunneling where an initial support is jacked into place or built within the TBM. 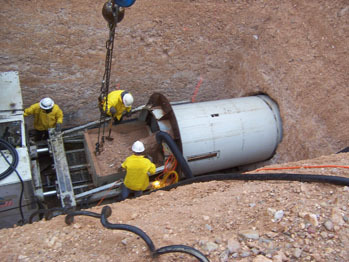 Conventional TBMs allow reconfiguration of the cutter head underground, which makes them particularly suitable for varying ground conditions such as unstable raveling sands, hard and soft clays, and soft rock formations. Conventional TBMs typically have the operator positioned near the front of the machine to observe soil conditions and monitor line and grade.